What is Microsoft Open License vs Open Value vs Cloud Licensing? I do not know about you, but I find Microsoft licensing to be confusing. 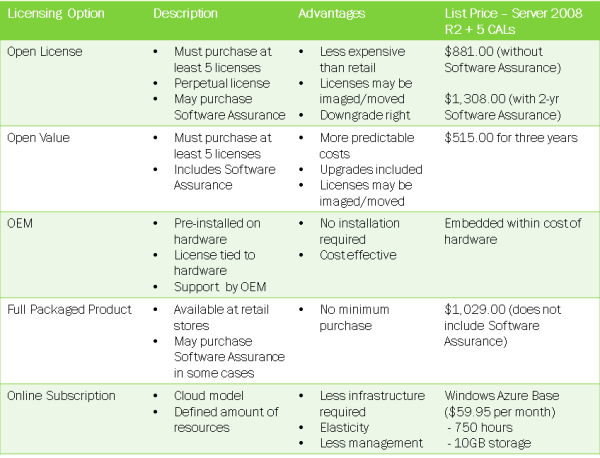 Here is a summary of Microsoft Open License vs Open Value vs Cloud and other licensing options. Microsoft has three main on-premise license types that are relevant to small business technology procurement - Volume, OEM and Full Packaged Product. Within Volume licensing, there are many options, but two are particularly useful for small businesses - Open License and Open Value. For both types, one must purchase a minimum of 5 licenses. Finally, there is the Online Subscription which is somewhat difficult to compare directly, but offers a Cloud alternative to on-premise deployments.